Scripted by Stanley Kubrick from Lionel White’s novel “Clean Break”, The Killing (1956) essentially put Kubrick on the map as a director after his earlier effort Killer’s Kiss (1955) suggested some promise. 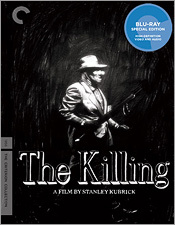 Both films have now been committed to Blu-ray by Criterion in a single release on which The Killing takes precedence and Killer’s Kiss gets added in as a supplement. The Killing is, of course, Kubrick’s case study of a racetrack heist gone awry complete with one of Kubrick’s favourite themes – how the inate fallibility of humans and their contrivances work to defeat human endeavors. Buttressed by voice-over narration and featuring a time-hopping story line, the entertaining film noir features the likes of Hollywood character stalwarts such as Sterling Hayden, Vince Edwards, Marie Windsor, Elisha Cook Jr., Timothy Carey, Joe Sawyer, Jay C. Flippen, and Ted de Corsia. Then there are the film’s many memorable images and characters including Sterling Hayden’s clown mask, Elisha Cook Jr.’s obsequious betting teller, and Timothy Carey’s smiling sharpshooter. Criterion’s black and white HD transfer is marvelous. It offers a nicely-detailed gray scale enhanced by deep blacks and consistent image sharpness and depth throughout. Framing is at 1.66:1 consistent with the original theatrical projection. Moderate grain is evident throughout and there is no evidence of significant digital manipulation. The mono LPCM audio delivers clean dialogue and a sense of dynamism in the shootout sequences. English subtitles are provided. The chief supplement is the aforementioned Killer’s Kiss, presented full frame in HD. The transfer looks almost as good as that for The Killing, although there is not quite the same level of consistency in image sharpness. The audio is delivered in Dolby Digital mono and does a decent job although some background hiss is sometimes apparent. There are English subtitles also for Killer’s Kiss. Other supplements include a recent interview with The Killing’s producer James Harris, archival interviews of Sterling Hayden for 1980s French TV, an interview with author Robert Polito on Jim Thompson who penned dialogue for The Killing, a video appreciation of Killer’s Kiss by film critic Geoffrey O’Brien, trailers for both The Killing and Killer’s Kiss, and a 22-page booklet including an essay by film historian Haden Guest and a reprinted interview with actress Marie Windsor. Highly recommended.